clarifies much of the confusion surrounding this perennial debate. He tackles the questions raised by the application of natural law with skill and honesty as he faces the difficulties of the subject. 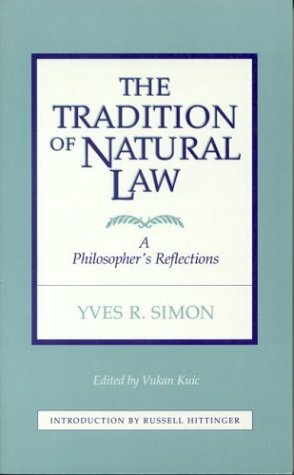 Simon warns against undue optimism in a revival of interest in natural law and insists that the study of natural law beings with the analysis of the law of the land. He writes not as a polemicist but as a philosopher, and he writes of natural law with the same force, conciseness, lucidity and simplicity which have distinguished all his other works. John Witte Jr. is the Jonas Robitscher Professor of Law and Director of the Center for the Study of Law and Religion at Emory University. He has published 120 articles and 20 books, including Law and Protestantism: The Legal Teachings of the Lutheran Reformationand The Reformation of Rights: Law, Religion, and Human Rights in Early Modern Calvinism.Frank S. Alexander is Professor of Law and Founding Director of the Center for the Study of Law and Religion at Emory University. He has published a dozen volumes, including The Weightier Matters of the Law: Essays on Law and Religion.